iPad 5th gen 32gb. Condition is like new. No iCloud locks ready to use. Apple iPad 5th Gen. 32GB, Wi-Fi Cellular (Unlocked), 9.7in - Space Gray. Condition is Used. Shipped with USPS Priority Mail. Comes with screen protector installed. The scratch shown in the picture is on the screen protector. Actual screen has no damage. Great condition overall, almost like-new if you take the screen protector off. Screen protector has some scratches from regular use. Cellular is Unlocked (was on Verizon). Comes with OEM charger and cable. Capacity: 32GB. iPad (5th generation). A1822 on the iPad (5th generation) Wi-Fi. The nano-SIM tray is on the right side on iPad (5th generation) Wi-Fi Cellular. gold aluminum housing. Model number (on the back cover). Apple iPad 5th Gen MP1U2LL/A (A1823) 32GB 9.7" WiFi Cellular Sprint- Space Gray. Condition is Used. Shipped with USPS Priority Mail. Can be used on WiFi or cellular on sprint. Apple iPad 5th Gen. 32GB, Wi-Fi, 9.7in - Silver. Condition is Used. Shipped with USPS Priority Mail. Compatibility:Wi-Fi 4G LTE AT&T. - iPad 5th Gen 9.7". What's included. New ListingApple iPad 5th Gen. (2017 Model) 32GB - Space Grey Demo Great Condition! Capacity: 32GB. DEMO NOTICE Color: Space Gray. I am located in Denver Colorado so I am centrally located for most of the US. 5 out of 5 stars - Apple iPad 5th Gen. (2017 Model) 32GB - Space Grey Demo Great Condition! 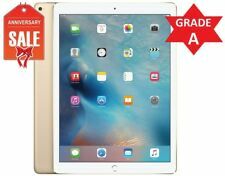 401 product ratings401 product ratings - Apple iPad 5th Gen. (2017 Model) 32GB - Space Grey Demo Great Condition! Apple iPad 5th Gen. 128GB, Wi-Fi, 9.7in - Space Gray (CA). Condition is Used. Shipped with USPS Priority Mail. Includes Apple Smart Cover, lightning cable, and power adapter. GREAT Condition Gray Apple iPad 5th Generation A1822 128GB WiFi LOOK! Low Price!